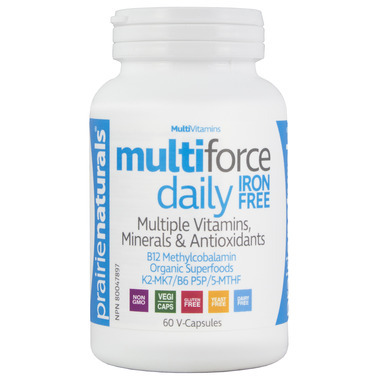 Prairie Naturals Multi-Force™ Daily Iron-Free ensures your daily optimal nutritional needs are fulfilled. Synergistically formulated to deliver a broad spectrum of more than 35 bioavailable vitamins, minerals, enzymes and antioxidants within a natural matrix of three powerful green superfoods - organic green tea, chlorella and spirulina. Researched and designed by a team of Canadian nutritional health experts. Recommended for post-menopausal women and for men with adequate iron. Formulated to reduce stress, support healthy aging and enhance energy. Non-Medicinal Ingredients: Mycrocrystalline cellulose, magnesium stearate, silicon dioxide, hypromellose, natural peppermint flavour. Caution: Hypersensitivity/allergy, nausea, vomiting and/or diarrhea have been known to occur, in which case discontinue use. Consult a health care practitioner prior to use if pregnant or breastfeeding, if you have a liver disorder, a gastointestinal lesion/ ulcer, or if you are taking anticoagulants/blood thinners, anti-inflammatories or antiboitics, or if you are having surgery. Something in the pill seems to have massively interfered with my meds in a way no multivitamin has before. My anxiety went through the roof.